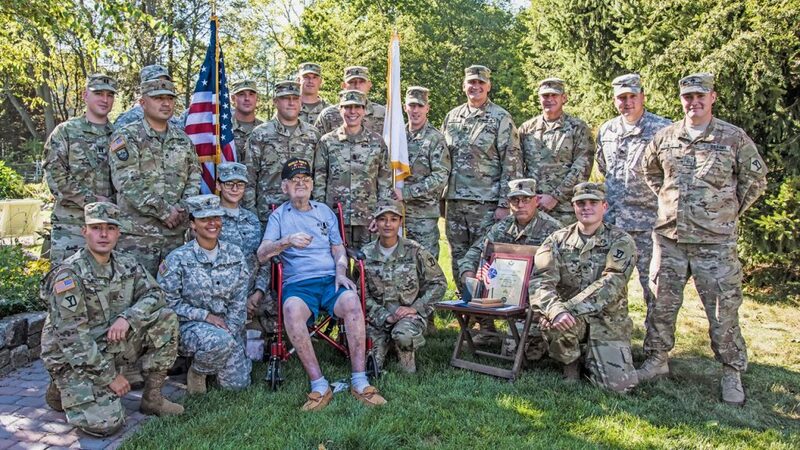 After a 71-year wait, Reading resident Corporal Bernard M. Pothier, 99, was officially promoted to Sergeant on Thursday, September 28, 2017, in a ceremony at his home on Charles Street that was well attended by family, local and state officials, and members of the Massachusetts National Guard. Corporal Pothier was stationed with Headquarters Squadron, 24th Pursuit Group, at Clark Field in the Philippines in December 1941. Hours after the Japanese bombed Pearl Harbor, they bombed Clark Field. Outmatched, the American and Philippine soldiers were backed into the Bataan peninsula. After a heroic four-month battle they were out of ammunition and food and were ordered to surrender. 75,000 American and Philippine troops were forced to march sixty-five miles in stifling heat. Thousands died along the way. This is now known as the Bataan Death March. 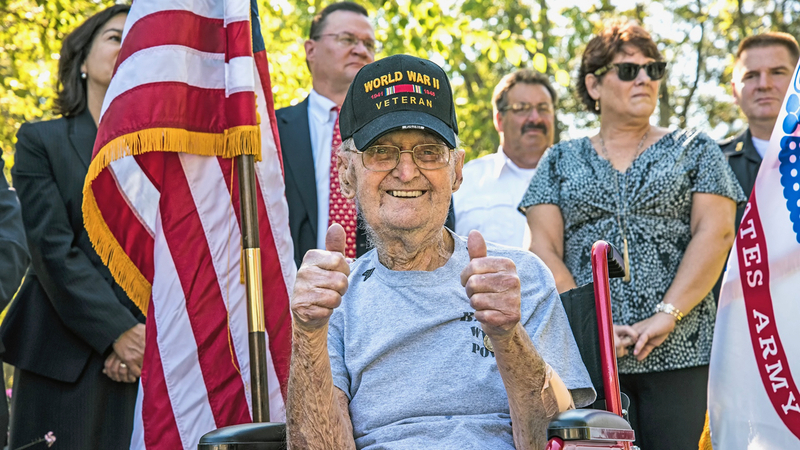 Corporal Pothier survived this march and the next three and a half years as a Prisoner of War. He witnessed the bomb destruction over Nagasaki and was finally liberated. After almost six years of service, Pothier was honorably discharged as a Corporal. While he was aware that others were being promoted to Sergeant, he never pursued the advancement. He returned home after his service, married his wife Marge, raised five wonderful children, and started a successful printing business. Recently, with the assistance of Representative Bradley Jones and Congressman Seth Moulton’s office his records were reviewed and he was found eligible for POW advancement as well as a Prisoner of War Medal he never received. 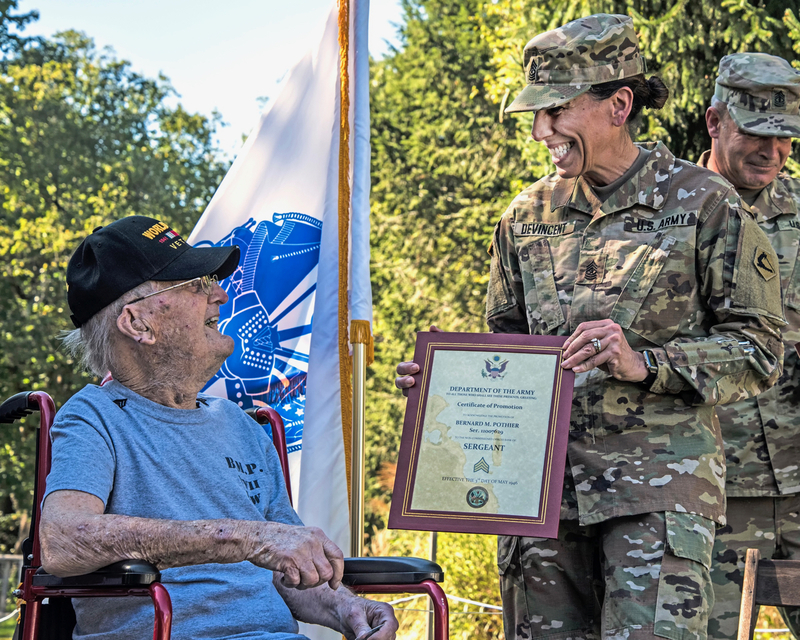 Reading Veterans Agent, Kevin Bohmiller, offered a special thank you to Sergeant Major Doris DeVincent and the many soldiers from the Massachusetts National Guard who came out Thursday to honor this true American hero. 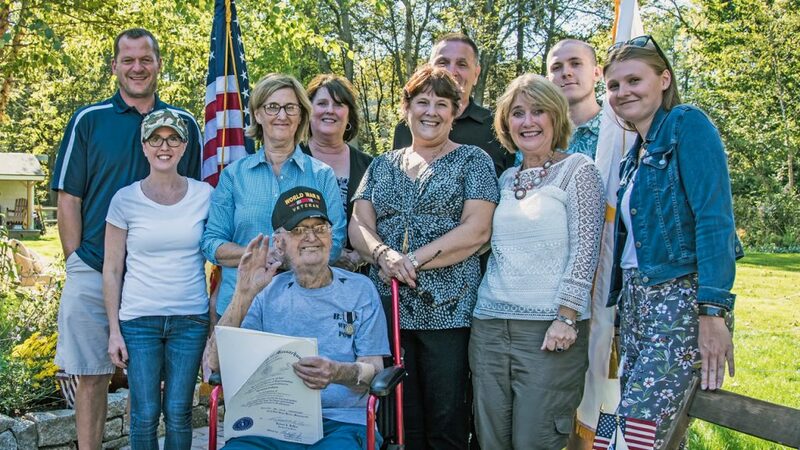 Town Manager Robert LeLacheur, Jr., Assistant Town Manager Jean Delios, State Representative Brad Jones, and Katharine Thibodeau from Congressman Seth Moulton’s office also attended the ceremony with Sergeant Pothier’s family and friends. For a video of courtesy of RCTV click below.